12 LISTS It's Called ForeshadowingHindsight is 20/20, and "Easter eggs" are inside jokes and references hidden for observant audiences, but there's a different name for the hints writers give at what's to come later in the story. List Rules Vote up the subtle details you can't believe you missed. The Wachowskis embedded so many layers of symbolism into their cult film trilogy, people are still uncovering secrets in the Matrix movies decades later. The first installment - released in 1999 - is particularly rife with Easter eggs; visual, verbal, and audible clues all hint at themes and key plot points from the second and third films in the trilogy. These secrets are buried with mixed degrees of subtlety. Christian allegories are laid thick, from biblical-inspired names like Trinity, the Nebuchadnezzar ship, and the human city of Zion, to Neo basically becoming Jesus in a trench coat (his journey of death, rebirth, and acquiring miraculous powers parallels the son of God's). If that isn't enough Matrix fan theory fodder, Neo's status as "the One" is also hinted at from the very start, since his name is an anagram of the word. While you might have picked up on some of the more obvious homages (like when Trinity tells Neo to "follow the white rabbit,") there's lots of other foreshadowing you probably missed in The Matrix. As Neo's boss chastises the hero for being late to work in the first movie, he looks over at the office window which is covered in specks of soap. The suds are then wiped away by a window cleaner to reveal a clearer view of the room. Many astute viewers reckon - as nothing in these movies happens by chance - the soap pattern on the window represents the scrawling green lines of code Neo's world is secretly constructed out of. Redditor /u/VonAether also pointed out, "the sound effect used for the squeegee on the window was used again later when Neo was getting sucked out of his pod in the power plant, hinting that even early in the movie he's trying to wake up." During the scene in which Neo hands off a computer file to Choi, eagle-eyed viewers can make out the title of the hollowed-out book Neo hides his contraband in, Simulacra & Simulation. This alone is an obvious peek behind the digital veil of the world he currently lives in, but it's also an academic reference. The book is real, written by French philosopher Jean Baudrillard, with the title referring to Baudrillard's theory that the modern world has become a "hyperreality" in which it's increasingly hard to distinguish the real from the virtual. To vastly oversimplify a complex idea, this is basically how humans experience the internet. Morpheus even quotes Baudrillard later on when he describes the Matrix as a "desert of the real." 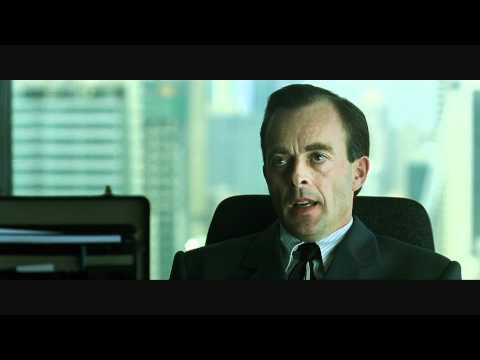 Neo's Boss Says He Needs "To Make A Choice"
You have a problem with authority, Mr. Anderson. You believe that you are special, that somehow the rules do not apply to you... The time has come to make a choice, Mr. Anderson. Neo's "problem with authority" underscores his rebellious streak and encourages him to eventually break just about every "rule" the Matrix has set in place (he can fly, dodge bullets, etc.). Like Neo's boss, Morpheus also believes Neo is "special," and his faith is rewarded by the end of the trilogy. While Reinhardt's arrogant tone may undermine his clairvoyance, he is right. Neo does have to make a choice: the blue pill, to remain in the virtual world, or the red pill, to wake up in reality. Upon one's first viewing, this line from Neo's client Choi sounds completely innocuous. "Hey, it just sounds to me like you might need to unplug, man." Once Neo's situation becomes clear however, Choi's use of the word "unplug" sticks out as obvious foreshadowing, since Neo later literally unplugs himself to see what the real world looks like.